Consider this: I can watch every fish swim up to my hook before it bites, I can see lots of fish throughout the day and I can keep some for the table. 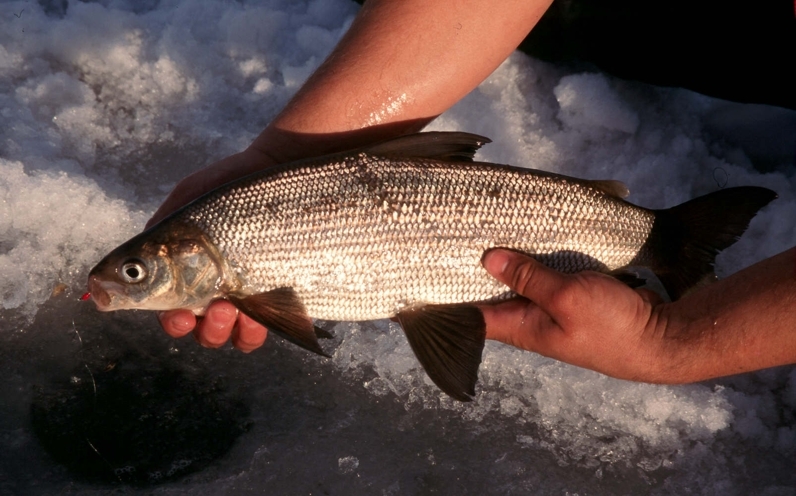 That in a nutshell is fishing for lake whitefish and it's no wonder anglers near and far pursue them throughout the winter. Add to the fact that they taste great and fishing for whites makes for a terrific outdoor experience. 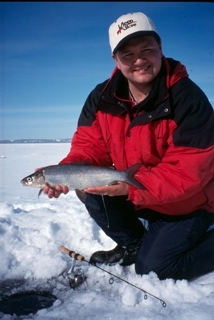 I spend a great deal of my ice fishing time hunting these silvery fish and along the way, I've learned a few tricks. Here are some of my tricks and hopefully they'll help you find and catch more whitefish this coming season. The Light Line Advantage - Whitefish are extremely sharp sighted and they routinely pick up nymphs or scuds so tiny, to see them many of us would have to squint. Given their great eyes, it's no wonder they can pick up a line tied to a hook and this alone has to be one of the biggest factors why whites reject a hook. It may not be because they weren't interested in the hook, but rather the line it was tied to caused suspicion and suspicion turned into rejection. 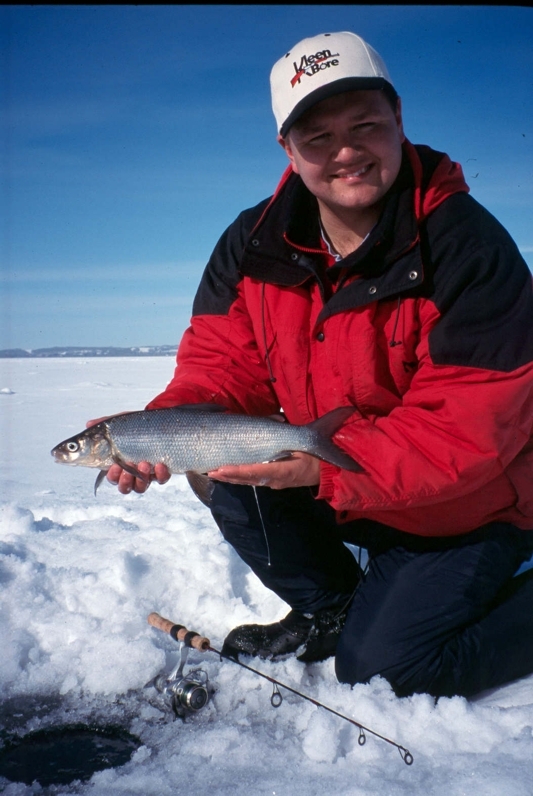 For all of my whitefish angling, I will either use four pound mono or use 5X tippet tied to the end of either four or six pound mono. The idea being that lighter line is thinner and therefore harder to see. If fish can't see the line, they'll bite the hook more often and that has been the result. I took this downsizing of line a step further and went lighter still, but it came at the expense of more breakoffs, so I've kept it at four pound mono. The Horizontal Advantage - Be it a fly or any of the multitudes of wireworms available, it pays to twist the knot to the point of the hook so that the hook suspends horizontally in the water. Horizontal is how most bugs orient themselves in the water and horizontal is how most fish see them, therefore horizontal is what I give the fish. The results are immediate and noticeable. Horizontal hooks catch more fish. The Low Light Advantage - There is a mountain of personal experience I'd like to call evidence that screams out loud and clear that first light is the time to be on the ice. 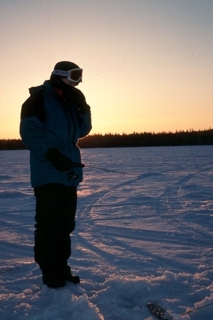 There have been too many times that I'll get to the lake at 9:00 am, well after the rising of the morning sun and as I head out on to the ice, I'll meet a string of oldtimers pulling sleds and buckets of whitefish on their way back in. They've caught their limits and their fishing day is done. As for me, I often need to tough it out for the entire rest of the day to pick up a limit. That's not to say I don't enjoy my time outdoors, for I certainly do, but what is clear is that the bite is hot and heavy early and the action tapers as the day wares on. The Weed Advantage - It's not everywhere and it's not a make or break rule, but I do find that when I'm fishing near or over weeds, I'm catching more whitefish. It makes sense that whites would be around weeds. Weeds provide the homes and protection for many of the bugs that whitefish eat, therefore, where there are weeds, there is likely to be whitefish nearby. But when it comes to weeds, be sure to be fishing over live green weeds rather than dead and decaying ones. The live green weeds promote life, the decaying ones consume oxygen and therefore, fewer fish will hang around them. Working the Water Column - Whites often have a feeding preference from day to day and why they feed where they do is anyone's guess, but the fact is, they do have preferences. Some days they're biting everything within an inch or two of bottom and that's it. 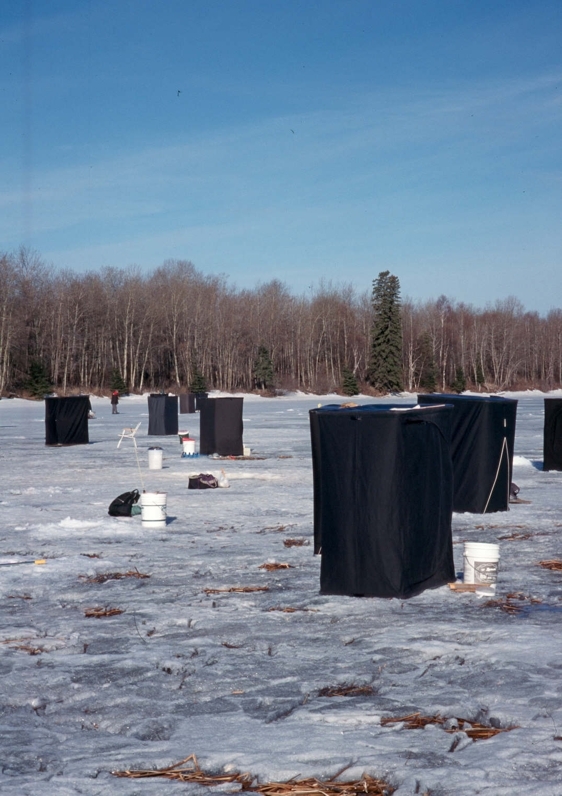 Other days they're hitting like hungry sharks inches below the ice fishing hole. Still other days they're biting somewhere in between. It's worth the effort to take the time to fish the entire water column, bottom to top and let the fish tell you what they want and where. Last but not Least - Slow and Steady Wins the Race - Aggressive fish will hit aggressive presentations. Aggressive fish will hit subtle presentations. Neutral or negative fish do not hit aggressive presentations, however, neutral or negative fish will often take a subtle presentation. Given that the subtle presentation will catch the aggressive as well as the neutral or negative fish, it pays to use that presentation most often. A wireworm or fly worked slowly will therefore catch more fish than one that is jigged more aggressively. 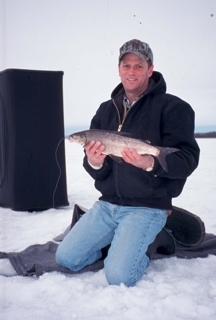 So there are a few tried and true whitefish tips that will help you catch more whites this winter. They certainly have for me. See you on the ice.